My earliest memory of cricket or Sachin (The two are entwined in my mind forever) was during the 1992 WC. It was a match with NZ. I was woken up by the excited murmurings of an uncle at home (this at around 4-5AM in the morning) to see a tiny batsman reach out & guide a full delivery to point. I don’t remember if the ball went for a boundary or not but I do remember the batsman & ended up slavishly follow him for the best part of my life. As cricket grew to occupy an important part of my life, especially with Indian wins, Sachin proved to be the driver of that. Given the pre-internet, pre-cable days at home, I ended up following Sachin through newspaper scorecards (even the limited information on the scorecards could tell immense stories for a highly imaginative 10 year old), highlights on DD (for India games) & cross cable connection (getting feed from someone else’s cable feed when their cable wire would cross your TV wire or as we called it “thiruttu” cable) (for overseas tours). It was through the grainy images of the thiruttu cable that I got to see Sachin’s audition for the opening slot. I would like to say that I caught that innings from ball 1. Sadly, I switched on the TV as I was getting ready to go to school & saw Sachin walking back towards the pavilion with the scorecard under him reading 82(49) which due to the graininess I read as 52(69). That sure was one way to downplay the greatest move for Indian ODI cricket. To paraphrase Neil Armstrong, one small shuffle up the order for Sachin, a large shuffle up the cricketing order for India. One day cricket has never been the same for India since that fateful day & the rest is history. Scour the net & there are tomes to be found on Sachin’s awesome knocks. Those twin centuries in Sharjah against the Aussies as well as the natural elements, the 98 against Pak in Centurion, the century against Zimbabwe in Benoni, the 1st ever double century against SA, the twin knocks in the finals agains the Aussies in the CB Series where he guided a chase in the 1st finals & set up a total in the 2nd finals, the savage mauling of Henry Olanga on the way to a sublime century, the 186 and the great 300 run partnership with Dravid versus NZ, the emotion filled century against Kenya after his dad had passed away. However what gets missed are some of his other knocks that may not have the weight in terms of runs but definitely have the weight in terms of the impact that it had on me. Each time Sachin gets out, it just feels like a massive disappointment, especially during the 90s when a Sachin dismissal was as good a sign as any to switch off the TV and get back to normal life. Some of these knocks that are special to me are truly gems as they magnified that feeling of disappointment when a truly special piece of magic is cut short in its prime. Thank you for captaining us to series victories in England & WI while leading us to our 1st victory in SA. Thank you for being passionate towards the game while upholding & paying your respects to it always. Thank you also for proving that there is more to the game than the game itself. PS: Had written a post a few years back on Dravid here. Those interested can check that one too. 1) Kudos of MS Dhoni & The Indian Cricket Team. Irrespective of the comments from the experts & past players, India being No.1 is no joke. The Indian team deserved this on the basis of consistent performance as well as the fact they have displayed signs of chucking the tag of bad travelers with some awe inspiring performances. Before all the former greats start moaning, they would be wise to take a step back & check where Indian cricket was during their playing days. India’s rise to the top was driven by a resourceful, charismatic, captain cool aligned with a once-in-a-lifetime middle order, a very strong & capable of taking the fight to the opposition opening duo, a new found emphasis on fast bowling led by an astute bowling captain & last but not the least, grit, resilience & valuable runs from the lower order. A team that had sufficient belief in themselves to mount fightbacks, rear guard actions & as well as display a sense of ruthlessness. Last but not the least, the role played by Gary Kirsten & his team. 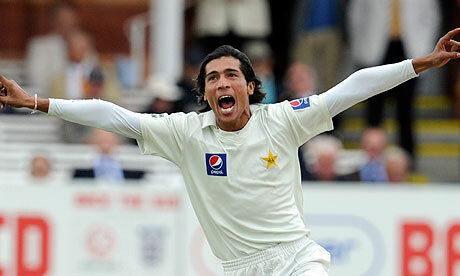 3) England’s biggest strength lies in the pace bowling variety & depth as well as the ability to hunt in packs. Anderson’s swing bowling nous & his status as pack leader, Barbie (aka Stuart Broad)’s pace coupled with his new found propensity to pitch it up, Bresnan’s skiddy back of length seaming deliveries, Chris Tremlett’s bounce allied with a tendency to seam the ball away from right handers & Steve Finn’s pace & bounce make for an effective & varied bowling attack. It is indeed a measure of their depth that they can play only 3 of the lot. 4) While its too early & premature to get into a postmortem of this disastrous England tour, India did look distinctly under cooked (no pun intended) & under prepared. While it does seem, in this increasingly crowded schedule, farfetched to expect India to play more than 2 practice matches, it was needed in this case considering how most of the key members in the team have not played together since the World Cup. 5) Those (read English commentators) bemoaning how IPL is ruining Indian youngsters can kindly STFU. Agreed that the primacy of test cricket is getting affected, why would any sane human being refuse an offer running the in the hundreds of thousands of dollars for 6 weeks of cricket. Most of these comments seem to materialize from the fact that they could not make the same amount of money when they played. (For once, I am in agreement with Messrs. Shastri & Gavaskar, Hey, stop judging now. 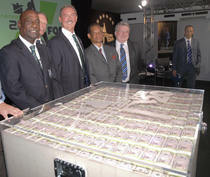 I just said once) Lest they forget, all I can say is beware of Americans bearing wads of money entering Lords in a helicopter to organize T20s flanked by former England & WI greats. 6) Injury & Fatigue management has to be a top priority for Indian cricket & the BCCI. Players dropping halfway through the tour, not appearing fit & looking seemingly tired are key problems that have to be addressed for India to be consistently on top of the table. Player schedule has to be addressed & it does no good when players are put in a position where they would have to select between a lucrative T20 tournament & a marquee tour. 7) Praveen Kumar has to be the find of the tour. For a man derided for his lack of pace, his ability to swing the ball either ways with no discernable change in action & control, accuracy & ability to check the runs when things are not happening are major pluses. That coupled with an attitude of a tear away fast bowler makes him a compelling competitor. 8. The No.6 position is again raising a lot of questions. Suresh Raina has not done enough to suggest that he is an answer for the position & his susceptibility to the short ball has not put to rest any misgivings. His ability to turn the arm over & bowl quick off spinning darts & presence in the field are pluses. However, his sole priority should be to score runs. 11) Lastly, one bad tour is enough. We have been at the receiving end of quite a few bad tours but none as bad as this. It probably hurts even more now because of the good job & the heightened expectation that this team has raised. Had this been the team of the 90s, I am sure it would not have hurt that much. But what is now essential is to focus on the tour of Australia towards the end of the year. A tour to Australia is always a hard tour & despite Australia not being in the best of forms, they are a wounded animal at home. That tour has to be one that is very likely to also be a swan song from our fabled middle order. Its essential to prepare well for that tour & strike hard. 2011 World Cup. India World Champions. Enough said. Just to leave with a few defining images. A detailed post will be out later. Avoiding eye contact with anyone, barely even hearing the verdict, for he knew what it would be, he walked out of the court in a daze, to the nearest rest room. As his eyes filled up, his controlled rage broke up and found a target in the judges thinking What do they know of poverty. Born & brought up in riches, how could they understand the difference that a few thousand pounds would make to himself, his family & his village. From extreme poverty to a meaningful life of comfort, thats all he wanted, nothing more. His rage-fueled thoughts found another outlet in his erstwhile bowling partner and his captain. In a parallel world, he would not have been so naive, gullible & greedy and instead, would have thrown the offer (& the money) back at their faces. In an alternate world, he would have chickened out, his fear of being caught would have outweighed his greed. In another multiverse, he would have actually gone ahead & reported to the authorities. PS: It indeed is a sad saga that someone as richly talented as Mohammed Amir had to suffer this humiliation as well as the penalty. While it is painful not to have this talented youngster buzzing around working magic with the ball, for once ICC has made the right decision. A strong action needed to be taken. Hopefully, time still being on Amir’s side, we shall see him in another 5 years. Until then, so long, ace. Wheres the Plan B, Captain? The times, they are a changing. Purists would say give the first session to the bowlers and make hay later. Such sentence hold no meaning for the modern crop of swashbuckling batsmen who would prefer to bring the bowler to their knees in the first session itself. Sehwag ,one of the modern greats,bats with a uncluttered mind and “see ball, hit ball” policy, demoralizes oppositions and quite often sets up the match in the first session itself. This policy is now being followed by other teams too. Dilshan’s career has seen an upswing post his move up the order. Tamim Iqbal has given England many scares and scars. Australia have Watson while captain cool Gayle can cook up a thunderstorm anytime he fancies the need. Graeme Smith is no shrinking violet himself. 100+ scores in the opening sessions are hardly a rarity but more of a norm when these batsmen are at the crease. Sadly though, this evolution in batting has hardly been marked by the evolution in strategies and tactics. Captains, despite the reputation of the batsmen, are still surprised when the onslaught begins. To put it very kindly, captains perform the headless chicken act. They are merely reacting. Even someone with an IQ of Sreesanth can figure out that these batsmen are pretty much in the mold of “take no prisoners”. Surely a Sehwag or a Dilshan is not going to hang around for a long time. Whats to prevent a captain from starting off with 2 slips, a gully, a backward point, 2 covers, a third man and a deep point and ask his bowlers to bowl well outside off. “But that is so defensive” is what the critics and ex-players would cry out. Well, the primary objective of a captain is to win games, not to play according to the rules of the game when the game itself has been changed by this form of batsmanship. Dry Throat. Clammy Feet. Nervous Hands. Pacing. Trying to sleep but not getting any. Big Day tomorrow. Running through hundreds of scenarios. Thinking of what going to happen. What is going to be dished out. A nearly forgotten man remembered again. The last survivor of the almost lost generation. Am I capable of handling it. Will I make tomorrow my day or will I just be another name with my fleeting 5 mins of fame. After all these years, knocking knocking knocking, finally a chance. Will I grab it. My entire dream, my passion, my goal. Just been waiting for this moment for my entire life time. These are probably some of the thoughts running through Badrinath as he makes his debut in another 9 hours. We wish you the best Badrinath and go do it, not for anyone but just for yourselves. If it had been anyone but Dravid, I am sure there would be lengthy press conferences and not-so-quiet rumblings but being the gentleman that he is, there was nary a sound from him. Instead he spoke louder through his actions, scoring a sublime unbeaten century proving a point again. Proving a point. That has been Dravid’s story. Branded as an unidimensional player at the start of his career, he has reinvented himself and scored over 10,000 ODI runs at an average a shade under 40 to prove his detractors wrong. For people who wrote him off after the disastrous tour Down Under in 1999, he replied by amassing over 600 runs the next tour. A quiet unassuming man, not for him the genius of Tendulkar or the magnificence of Lara or the power of Ponting. Instead, he has ground out attacks. Unflinching in the face of adversity and capable of absorbing anything thrown at him, he earned himself the sobriquet of “The Wall”. And that solid he has been for Team India. Look back at some of Team India’s greatest overseas victories and it is replete with instances of Dravid being instrumental in achieving those victories. The phenomenal double century in the first innings and the gritty unbeaten 72 in the 2nd innings where he was just going on empty, at Adelaide. The master class of 148 in blustery, damp, dank, wickedly swinging and seaming Headingly track leading to a famous victory. The twin fifties on a devilish minefield at Sabina Park where one only player apart from him scored above 60 in a low scoring scrap.The massive 270 at Rawalpindi where despite not being in the best of touches, he hung in there and ensured that India won the match and series in Pakistan. Throw in over 180 catches, a captaincy stint that led to series victories in England and West Indies and a first ever win in S Africa, Dravid is veritably the finest No.3 that India has produced. In a team replete with stroke makers, Dravid is the glue that holds it together and provides solidity. Over the last 2 years, when the man was not as solid as he normally is, the team had a shaky feel to it, capable of imploding spectacularly. Dravid has spent most of his career under the shadow of Sachin. However, in the near future (when Dravid retires), Team India will realize that he cast an equal shadow and had an equal influence (if not greater) as Sachin. PS: Last Word. Ponting – 136 Test matches – 11345 runs. 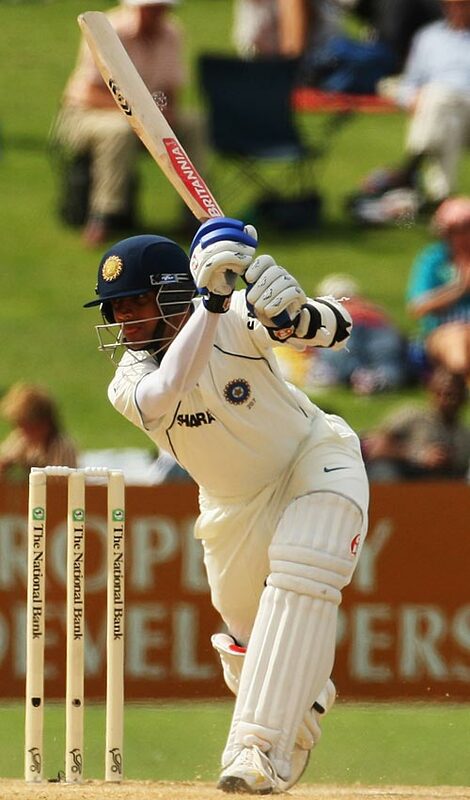 Dravid – 134 Test matches – 10823 runs. Just 500 runs behind in 2 less games. Does that make him a lesser player? One of the most common refrain thats been doing the rounds is how Australia are missing McGrath and Warne and which is one reason that their cricket team is not as formidable as before. Warne provides ample evidence of the same with his stint in the IPL whereas McGrath was virtually ignored by the Delhi Daredevils team management. Today, Delhi and the world were shown what they were missing. Not handed the new ball, the great man came in as first change. Nothing much had changed, the run up was the same, the action till the delivery was the same. It was watching the most economical and effortless action all over again. First ball to the batsman, a gently outswinging full delivery, fuller than his normal back of the length but nevertheless on that impeccable line, just on the much abused corridor of uncertainty. 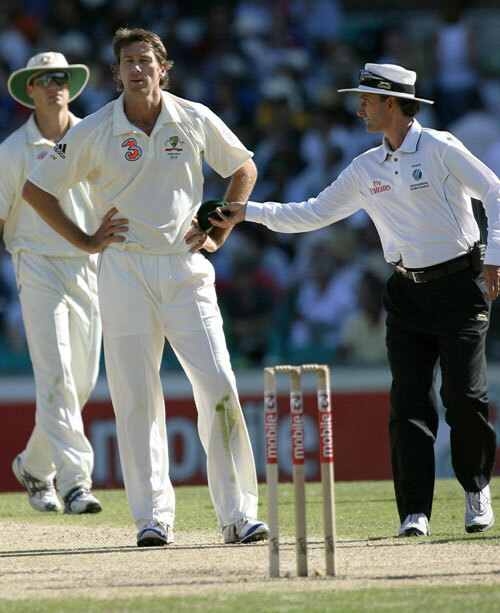 Bowling a fuller length than he usually does, McGrath was down on pace but still that impeccable line. A quiet first over followed. Next in line was a left hander and McGrath produced a beauty. Starting just outside off, the ball swung in a shade, just from a length, clipped the batsman’s pad and thundered into off. That was what he was waiting for. A leap as he usually does and still displaying all that competitive streak, that made him the champion bowler that he was. What makes this even more amazing is that the great man had last played in a competitive match way back in the first season of the IPL in the semis and had had his last practise 5 months back. To be out of action for all this time and yet land the first ball on that line is a feat beyond imagination. At end of the 2nd day’s play during the 2nd test of the Ashes, the question reverberating through everyone’s mind was whether Strauss would chose to enforce the follow-on. This was a decision that would not have merited a 2nd thought even as recently as 10 years ago. While conceding the fact that pitches have become far easier to play these days and the quality of bowling has generally come down, if there is one reason why captain are loath to impose the follow-on, it is because of a man named VVS Laxman and the career-defining innings that he played on a hot day. I still remember the day. March of 2001, it was the 12th standard board exam time and like most moms, my mom was dead against me watching cricket (she still is but then now it cant be helped). Plus those were the pre-cable days in my house and good ol’ DD would show only 2 hrs of play. The first and the last hour of play. So I would ensure that I would catch that up. Imagine my shock when I switched the TV on at 3.30 and it was still the duo of Dravid and Laxman batting on. This was sporting miracle at its best. There was joyous outpouring, I did a lil jig to which a standard mom’s reply came back “Its after all only cricket, you can watch it after your board exams (replace board exams with semester exams, mock CATs, CAT, office) get over. And obviously call up other equally excited junta on phone on pretext of discussing a doubt to further dissect the match. I remember watching the highlights as a solace and wondering at the fortitude of the 2 men in the middle defying the all-conquering Aussies. 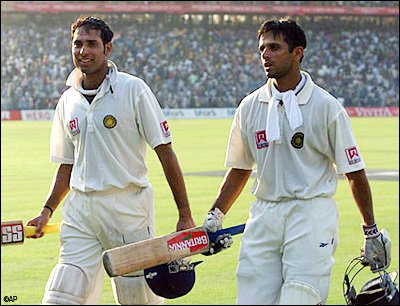 What stood out in that partnership was the way Laxman went about his innings. With the calm of a Zen master (as described by Dravid), he went about playing his shots when even a single false stroke could have sealed the match. That one innings is likely to define Laxman’s career irrespective of whatever else he achieves. The effect of that innings has been that captains nowadays have been extremely reluctant to enforce a follow-on fearing that someone else might do a “Laxman” again. I remember when India toured Down Under in 2003 for the reciprocal series and were facing down the barrel with 4 wickets lost for less than 80 behind a mammoth first innings Aussie total, the questions asked to Steve Waugh was more around whether he would enforce the follow-on. (Its a different matter that Dravid and Laxman scored scintillating centuries and nearly repeated Kolkata). That was the effect of such a monumental innings. The Laxman Effect seems to a fairly good phenomenon to be added to the cricketing jargon and in the context of the game, deserves to be called as one of the greatest innings ever played. PS: This has been typed on a laptop where the space bar has been functioning as consistently as Shahid Afridi, hence loads of bloopers are possible.